Can you Convert Pool Times to Open Water? While one would think that a basic formula could be used to calculate how your pool splits translate to open water, the variables under consideration here are almost endless. First, think about not having to reverse course every 25 yards. Then consider the effect of buoyancy if you happen to be using a wetsuit or are swimming in salt water, or both. Are there waves, how about a current in your body of water; are you satisfactory at drafting? Do your times expand when you switch from indoor short course (25 yards) to indoor long course (50 meters)? If so, it’s likely that your outdoor times will as well. Even more so if swimming efficiency is not your strength. But let’s take a step back here. If you’re like many of us, you came from a running or cycling background and the swim leg is simply the race leg you must endure before transitioning to something you really like. As you’d guess, you’re not alone here. Perhaps, like one of the triathletes I was asked to profile for IRONMAN this year, you came from a background that included no swimming. You couldn’t swim a stroke! However, now you’re planning on biting off a couple miles of open water madness. So before we think about performance in this new environment, let’s just make it doable by planning our training to include the skills necessary for a great race experience. The first thing needed is a smooth, balanced stroke. A good, straight body line, balanced stroke and de-emphasized kick best achieved with a symmetrical body role and bilateral breathing, which if you don’t do already is most useful. Plus you can see both halves of the field, race course, upcoming buoys, etc. if you breathe on both sides. Should you have access to open water prior to race day, even if it’s only once, you can do wonders for race-day nerves and ensure your best performance. Having a swim buddy and safety boat lifeguard on this first open water effort will give you the confidence to work on your technique and acclimate to conditions while leaving some of the details to the buddy and guard. While experiencing this out of pool environment, take a moment to imagine race-day conditions as different from your training swim. Water temperature, wind from a different direction, the presence of the other swimmers in your wave nearby, some very nearby, etc. Take the sun for example, possibly high in the sky for the orientation swim but coming right across the tree tops leading to significant glare on race morning. For this reason it is optimal for you to practice the course at a time nearest to your own start time as possible. Now you need a race plan. From arriving at the race venue to stepping out of the water into T1, you need to have thought this whole thing through. This is where knowledge of your own swim pace can come in quite handy. The pace at which you moderately pool swim is the pace you’ll hold, mirror actually, as a sustainable effort over the entire distance. We’re not talking 100’s on the 1:30 here necessarily, but a steady, continuous, reproducible effort. A pace that, in the face of other swimmers nearby, waves, wind, etc. that you’re comfortable with. You want to be ready for anything, right? No black line, the ability to sight having practiced it indoors making it a defined part of your stroke when needed. This must be true even if the water is a little rough. If it’s really rough, perhaps you (and the race director) may need to reevaluate whether or not you should be doing this. Water clarity: Unless you’re swimming in Kailua Bay, Hawaii, the water clarity that allows you to see the black line in your pool lane will drop to just a couple of feet. I’ve always considered this a positive as I’d rather not see what’s on the bottom. Surface conditions: wind and waves. You’re used to a little lane turbulence, especially circle swimming, so unless it’s pretty windy, which may affect your course line, it won’t really interfere with breathing. Water temperature: unless it’s a summer swim, the water temp will be cooler than you’re used to. If your pool is, say 82 degrees, it can be eye-opening to take your first few strokes at 72 degrees, or even cooler. While there are definitely swimmers who can go wetsuit-less in 60-degree conditions, most will choose not to. Navigation/sighting: it’s an acquired skill. The ability to swim straight, and thus not farther by weaving down the race course, just comes from practice. 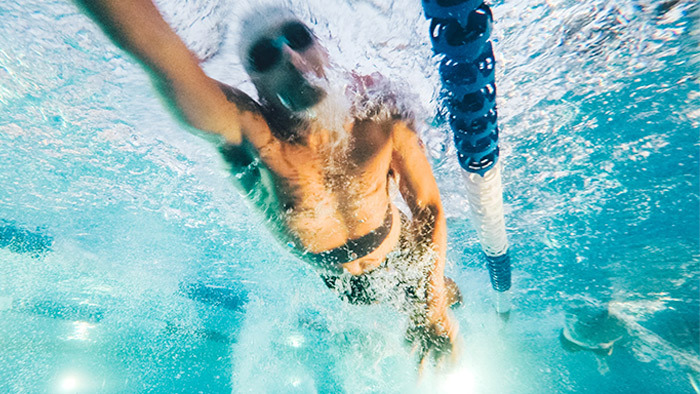 Many suggest seeing how far down a lane you can swim with your eyes closed before touching a lane line. There are a number of good Youtube videos to teach you, but there’s no substitute for just doing it both in the pool and at open water practice. Prior to race day preparation, imagining multiple scenarios of choppy water, fatigue, cold/warm conditions, etc. allows you to build and maintain your learned, smooth, steady stroke. That in turn will allow you to remain calm ensuring your success and your fastest swim. So, while there really is no equation for converting pool times to open water times, there’s a very clear formula for having a safe effort and entering T1 with a smile on your face.